Just how much does an oxygen tank weigh? You see, there is nothing worse than not feeling as though you have the freedom to act on your own accord. No one wants to go through life forced to deal with the repercussions of not being able to choose for themselves. The concept of liberty is so inborn and intrinsic to us that the idea of life without it can seem impossible, to say nothing of unworthwhile. It’s hard to imagine something which is even more intrinsic than that drive for freedom. If there is a contender for that crown, however, it would be the very ability to breathe. For as much as we talk about things being “universal,” or say that “everyone,” wants or feels a certain way, breathing and that most basic need of clean oxygen to survive fits the bill unlike anything else. The need for quality oxygen is more than a human right – it is needed for our very survival. And yet, at the same time, countless people every year find themselves unable to get the oxygen they need. Few things are more integral to our lives and livelihood than being able to breathe. That much is clear. What isn’t always clear is how those of us living with conditions which leave us short of breath can get the oxygen we need to breathe with ease. Since their invention decades ago, oxygen tanks have proven to be a key answer to that need. At the same time, however, while oxygen tanks undoubtedly fill a niche for which there is an ever-present need, there remain questions to answer. What conditions can they help treat? What type of oxygen tanks are best? What other important factors can help determine if oxygen tanks are right for you? This guide will help those looking to obtain portable oxygen tanks for treatment answer some of those questions and get started towards finding the right solutions for their particular needs. First, it is worth noting just how revolutionary oxygen tanks are in terms of how they help us. 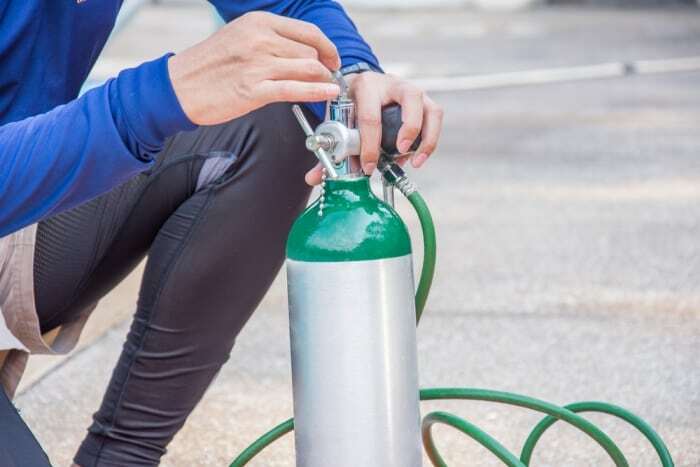 That last point hints at one of the most important aspects of an oxygen tank – namely, that the oxygen it carries is typically of a highly-purified nature. By contrast, while the air around us obvious contains enough oxygen for us to breathe with ease, that sometimes isn’t “enough” for those requiring purer oxygen. In particular, patients living in cities with poor air quality or who otherwise require purified air for treatment can benefit from having their own personal oxygen tank on hand. How Much Do Portable Oxygen Tanks Weigh? Next, you will want to consider the size, shape, and weight of a standard oxygen tank. There is a great variation in terms of the different sizes and shapes of oxygen tanks available, due in no small part to the fact that the uses for which they are used are equally various. The same may be said about the frequency with which these units are used. A key distinction to draw here is the difference between everyday use and regular treatment. In the former case, a patient needs an oxygen tank to breathe properly – full stop. As such, they remain connected to an oxygen tank constantly or nearly so. By contrast, there are patients who only need to remain “tubed” for a certain amount of time for a given treatment. Here, there is a further distinction between whether that amount of time is a one-off or recurring. If you are looking to get an oxygen tank for regular personal use, either for constant use in terms of breathing assistance or else regular recurring treatments, you are probably looking at getting an oxygen tank which is a few cubic meters big. Whether this is 2, 4, 6, or more cubic meters will, again, depend on the nature of the treatment – the longer you require treatment, the larger the tank will be, since you’ll want to make sure that the treatment remains as uninterrupted as possible. In terms of weight, therefore, you’ll really be concerned with two weights – that of the tank itself when empty and that of the unit when fully filled up. For example, a standard 6.9 cubic meter tank will typically carry more than 20 lbs (or 9.1kgs) worth of oxygen. That said, the tanks themselves are typically well over 100 lbs (45.35 kgs) in terms of their given weight, they can weigh as much as 130 lbs (59kgs). As such, taken together, a full large oxygen tank for regular use is likely to weigh in excess of 150 lbs (68 kgs). It is worth mentioning that, to use your oxygen tank, you’ll obviously need either a facial or nasal mask. While these are typically made from lightweight materials, and so should not add to the overall weight of the unit to any substantial degree, you will nevertheless want to consider which one is best for your needs. This is going to be different for every treatment and, indeed, every person. You will, thus, want to confer with your doctor whether one is better for your situation than the other, or indeed, if both may be beneficial for different situations. There are two main different types of tanks – the “traditional” cylindrical oxygen tanks that most people know about, and oxygen concentrators. The former are what is accounted for above in terms of the size and weight of a typical tank. Oxygen concentrators, by contrast, are far more recent, emerging on the medical scene over the past 40+ years. They were, in part, a response to one of the most obvious problems with traditional oxygen tanks – namely, just how big and heavy they typically are. While you might be okay with having a large tank in your home, if you plan on traveling at all, chances are you aren’t going to want to haul around even a smaller tank weighing dozens of pounds, let alone a full-blown large one weighing well over 100 lbs. Oxygen concentrators, by contrast, are far more lightweight and, thus, portable. This, taken together with their compact, boxier shape, tends to make them a better choice for some patients who wish or need to be mobile while receiving treatment. That said, oxygen concentrators are designed to provide a lower-pressure flow of oxygen than full-blown tanks. As such, they are recommended for patients for whom this is acceptable, while patients requiring more constant high-pressure flows of oxygen are better suited to oxygen tanks. Another key question to consider when looking into different treatment options is just how much all of this will cost. You never want to be priced out of treatment, of course, and oxygen tanks are vital enough in terms of treatment that there is a good chance that your health insurance may help to pay for your units. You don’t want to have to shoulder more of a financial burden than is necessary. The cost per day, week, month, and year. That last point is especially important, as some units are more affordable for shorter-term treatments, and others, while more expensive at first, even out or are less expensive for longer-term treatments. In the end, you’ll want to discuss things with your doctor and healthcare provider to determine the right tank model for you in terms of both use, as well as affordability. There are a few other things you’ll want to consider when it comes to the world of oxygen tanks. For one thing, there’s always the possibility of renting a tank. While this tends to be a better idea for shorter rather than longer-term or permanent treatments, you’ll definitely want to ask your doctor and healthcare provider if it’s right for you. At the same time, you’ll also want to “weigh” your options when it comes to finding lighter tanks for travel. If you are traveling by plane, you are going to want to first check and make sure that the model you are using has been cleared by TSA and the FAA. If you have questions about that, call ahead of time and ask; most airlines have set policies on this, and will be glad to help. With this information on the weight, size, usage, and utility of oxygen tanks and concentrators, you can breathe easy once again.